Programmers rarely code in isolation anymore. Except in the case of personal hobby projects, most modern projects have too vast a scope for one person to tackle alone. As such, if you’re a programmer and you aren’t yet sharing or collaborating, you’re behind the curve. Fortunately, this kind of sharing and collaborating is now trivial to incorporate into your workflow. Unlocking this raw power is as simple as signing up for a free account or two, then convincing your teammates to do the same. If you can get that far, you’ll soon reap the benefits of the web apps I’m about to show you. If they seem weird or useless at first, just give them a few days to prove how useful they can be. Bitbucket is a free hosting service for code repositories that are based on Mercurial or Git. Most coders tend to prefer Github (which we’ll cover next) over Bitbucket, but I actually prefer this one because the plans are a bit friendlier and more flexible for those of us with shallow pockets. It’s free for teams up to 5 people, which is more than enough for most hobbyists, and all plans provide unlimited private repositories. Pricing is tiered based on team size, capping at $200 per month for unlimited team size. Github, which is officially the largest code host in the world at the time of this writing, exploded onto the scene in the late 2000s and became the de facto social networking site for programmers. It heavily encourages an open source mindset by making all code projects public by default and making it extremely easy to fork projects with a one-click button. 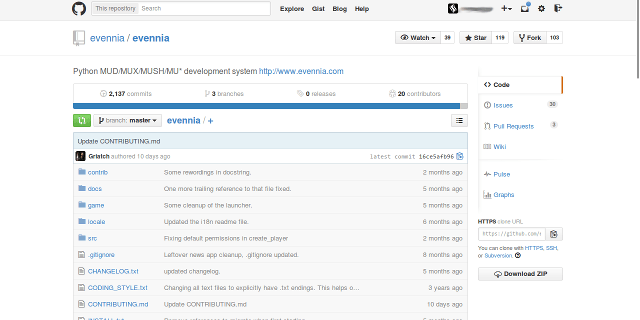 All projects also come with a built-in wiki, task manager, and bug tracker. If you want a private repository on Github, you need to pay. All paid plans support unlimited team members; the only reason to go up a tier is to increase the number of available private repositories. Snowy Evening is admittedly a strange name, but the concept of it is rather useful. It’s a bug tracker that integrates seamlessly with Github and Bitbucket, though you can use it on its own if you aren’t using either of those. Free plans support unlimited public projects and one private project and no team-wide file storage. For more private projects and more storage space, there are plans from $9 per month to $99 per month. Gitter is a wonderful social chatting tool for Github users. (The login system requires that you have and use a Github account.) It’s basically a contemporary web version of Internet Relay Chat: lots of different chatrooms you can join and converse in. Three types of chat channels exist: 1) channels tied to Github teams, 2) channels tied to Github repositories, and 3) standalone channels created directly by users. Channels can be public or private, but private user channels require a Premium account for $2 per month. Gitter is new but constantly improving, so if you’re an avid Github user you should really give it a try. Here at MakeUseOf, Slack has been one of our primary modes of communication for almost an entire year — and it has proven invaluable for easier project management. The best way to describe it is IRC 2.0: the same core chatting functionality as IRC but with lots of extra bells and whistles on top. If your project team is still using IRC for communication, I highly recommend that you consider switching to Slack. It’s web-based for convenience, but has official apps available for Android, iOS, and Mac. A Windows client is also in beta production. 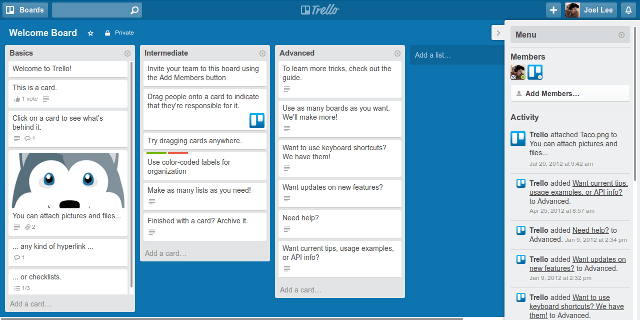 Many of the MakeUseOf Editors live and die by Trello‘s organizational features. Here’s how it works. You create boards (projects) and each board consists of multiple lists (categories) that are comprised of individual cards (tasks). Cards can be tagged with several pieces of information: due dates, participating members, color-coded labels, etc. Each card also has a comment system for task-specific discussion as well as the ability to host attachments. Top it off with a drag-and-drop interface for shuffling cards around and you get a fast and convenient way to stay organized. I personally don’t use Trello as often as I should, but I certainly see the appeal and utility of it. It’s a little overkill if all you need is a simple to-do list, but for more complex projects, it’s absolutely essential. 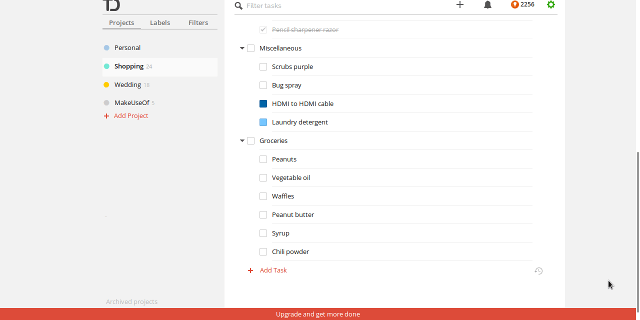 If Trello is too much for you, my other recommendation is Todoist. This beautifully sleek tool is used by several of MakeUseOf’s writing staff to keep tasks in line and personal projects in order. It’s what a to-do list should be. Free accounts are good enough for most people, but upgrading to Premium for $29 per year grants features like task reminders, custom filters, productivity tracking, automatic backups, project synchronization, and more. Are you still using Skype or one of these Skype alternatives to handle your team’s video chats? If so, stop everything you’re doing and check out Appear.In. This web app is more convenient and less intrusive than Skype ever was or will be. The one downside is that it only supports up to 8 users per room. Skype’s free video chat only supports up to 25 users per conversation, but Appear.in is lightweight. There’s no reason not to use it. Whether you’re a brand new programmer or someone who’s well on their way towards programming mastery, these web tools will surely come in handy. Each of them has boosted my own productivity in one way or another and I hope they all do the same for you.